Andrew Lesnie, ACS and director Peter Jackson take on The Two Towers, the second installment of New Line's epic Lord of the Rings trilogy. The second film in New Line Cinemas The Lord of the Rings trilogy, The Two Towers, takes the members of the now-sundered Fellowship into darker, more perilous terrain. Against the backdrops of Rohan and Gondor, our heroes must confront the vast armies of Mordor and Isengard as the final war with the evil lord Sauron becomes increasingly inevitable. Hobbits Frodo (Elijah Wood) and Sam (Sean Astin), now accompanied by Gollum (Andy Serkis), continue their arduous journey to Mount Doom, while the other Hobbits, Merry (Dominic Monaghan) and Pippin (Billy Boyd), escape from their Uruk captors and meet the Ents of Fangorn Forest. Meanwhile, Aragorn (Viggo Mortensen), Legolas (Orlando Bloom) and Gimli (John Rhys-Davies) pursue the Hobbits captors, and then make a stand against the forces of Saruman (Christopher Lee) at Helms Deep. Director of photography Andrew Lesnie, ACS, who won an Academy Award and earned an ASC Award nomination for his work on the trilogys first chapter, The Fellowship of the Ring (see AC Dec. 01), says the visual arc that director Peter Jackson and he conceived for the trilogy entails a slow shift toward grittier, darker and dirtier images. Accordingly, much of the action in each narrative thread of The Two Towers occurs against the backdrop of aggressive and dramatic landscapes. "Theres certainly less of the nicer places, such as The Shire, Lothlórien or Rivendell, in The Two Towers," Lesnie confirms. Lesnie describes the visual scheme of The Two Towers as "hardened reality." He explains, "For The Fellowship of the Ring, I was very conscious of modeling with light, applying a black-and-white philosophy in using the tonal scale to create separation, rather than [doing so] through color. For The Two Towers, I decided that the light should be less controlled. I was able to follow the travails of each group and decide what was appropriate for the mood at any particular moment. Middle-Earth is descending into a very dark time, and the characters are battling to find light at the end of the tunnel, so the film needed to be more realistic and aggressive than The Fellowship of the Ring. The overall feel is less magical, and the story has become fractured and splintered." 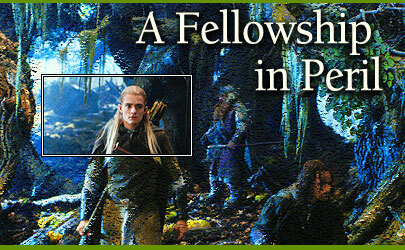 The disintegration of the Fellowship necessitates a complex narrative structure, and it also provides the filmmakers with the opportunity to explore the themes of destiny and mortality. The story of Frodo, Sam and Gollum is as much a journey into the darker side of Frodos soul, as he struggles against the Rings evil power, as it is a journey across the shadowy lands of Middle-Earth. Lesnie cites a key scene from The Fellowship of the Ring  a conversation between Frodo and Gandalf in the Mines of Moria  as a cornerstone that provides subtext for Frodos continuing journey. "I feel that the scene in which they talk about Gollum sets up the themes for the storyline that involves Frodo, Sam and Gollum in The Two Towers," says the cinematographer. "Frodo comes to realize that Gollum represents what he may become. That scene is also a comment on the nature of compassion, and this is related to Frodos struggle against the power of the Ring. The theme is that everyone is essentially good, but there are dark forces in life that affect us. Its how you deal with those forces that is the measure of your character. This kind of thing isnt necessarily easy to translate into a visual concept, but while Peter and I were blocking scenes and working out the coverage, these thoughts were in the back of my mind." Themes and storylines introduced in The Fellowship of the Ring are expanded in The Two Towers through a variety of means. "Peter knows that in dealing with a trilogy of this complexity, one has to be able to interweave themes and issues throughout all three films," Lesnie points out. "This is something that is so evident in J.R.R. Tolkiens books. The story of the ill-fated Boromir [Sean Bean] from The Fellowship of the Ring is continued when Frodo and his companions encounter Boromirs brother, Faramir [David Wenham], in The Two Towers, and that story will continue further in the third film. In the case of Aragorn, he is not only on a journey to confront his own destiny, but he is also in love with Elronds daughter, Arwen [Liv Tyler], who will outlive him. This is an issue that periodically comes to the fore in The Two Towers, when Aragorn is close to death; we explore it through what can be described as dream sequences. To express such themes visually, I approached many of these sequences on an abstract level, seeking to create scenarios that show the characters perception of mortality." Another departure from the style of The Fellowship of the Ring was the reduction in the number of eyelights used on actors. "Peter was very specific about the use of eyelights for the first film," Lesnie recalls. "For the second film, however, we used them less frequently because we wanted to impart the feeling of less-controlled light. This, in combination with other elements, signals that the characters must think seriously about their abilities to affect the outcomes of situations in which they find themselves." During postproduction on the film at The PostHouse AG, Lesnie and supervising digital colorist Peter Doyle also enhanced the sense of creeping menace through "the subliminal idea that the more anger or fear one feels, the sharper things appear to be." Doyle explains, "We built a new set of sharpening kernels for The Two Towers. They pick up where the lens drops off, and the frequency is just a little bit higher than the film grain, so [they really provide] a nice zing without making the grain scream  thereby avoiding the video look that some digital intermediates have when they get too sharp." For the digital grading, Weta Digital scanned the negative at 2K full aperture on two Imagica X-3000 scanners using proprietary look-up tables built by PostHouse and Weta. The scans were then fed onto a central server with around 4.5 terabytes of Raid disk that in itself is capable of delivering 1K at real time or 2K at six frames per second. "These unibyte disks were built for us in Germany, and I like them because they come with lots of little blue, flashing lights," Doyle says with a laugh. "That server hangs off an Origin 2000 server, from which we feed three Octane V2s using V8 Graphics. Each workstation has 2.7 terabytes of Raid disk configured to deliver 1K real time to each operator. The film was shot in the Super 35 format, and when we recorded back out to film we used a proprietary digital squeeze onto EK 5242. We then duped onto Eastman stocks and made release prints on Fuji 3513D." Shooting on Kodak emulsions and printing on Fuji print stock was a strategy Lesnie had also applied on The Fellowship of the Ring. The cinematographer notes that he and Jackson were after a softer contrast than the Kodak print stocks allow, explaining, "We felt that the Fuji print stock was more forgiving in the lower gray tones." Adds Doyle, "Technically, it isnt softer  it has a more extended MTF [Modulation Transfer Function] response in the blue layer than Kodak. The grain, however, has a different look than Kodak stock, and I think the Fuji blends the colors a bit more. With digital grading, youre interested in the density or the dynamic range, grain and sharpness. The more linear the stocks curve, the better." One of the most striking sets in The Two Towers is the Rohan city of Edoras, home of King Théodens Golden Hall. The life-size set was built on a solitary hill in an otherwise flat valley on New Zealands rugged South Island, with the Southern Alps forming a natural, dramatic backdrop. "The only downside was that sometimes incredibly strong winds would come rocketing through the valley at hundreds of kilometers an hour," Lesnie recalls. "We therefore worked without putting up big diffusion materials." For wide shots involving hundreds of extras, Lesnie used two 50K SoftSuns for fill, describing them as "great lamps for generating a broad hit over an area. If we were in a situation where the sun was backlighting a group of people in a field, I was able to put up two track booms [Condors mounted on caterpillar tracks] with a SoftSun in each, and theyd throw enough to just lift the shadow area. When we moved into two-shots and singles, we brought the SoftSuns in closer and used diffusion frames." © 2002 American Society of Cinematographers.